How to fix Windows 10 Upgrade Fail to install black screen error no cursor and Windows 10 upgrade error 80072ee2 80072efe c1900101 80072efd. With the recent offer from Microsoft to upgrade Windows 7, Windows 8 or Windows 8.1 to Windows 10 for free, many have already upgraded theirs to Windows 10. However, a huge portion of users had either undergone or still stuck with this Windows 10 upgrade failed Black screen error. The black screen occurs during the preparation phase right after the download process from using Windows Update. If you minimize your Windows Update and do something else while Windows Update was downloading Windows 10 for the update, the black screen would just appear in the middle of whatever you are doing before you can react. If you do a search on Windows 10 upgrade failed black screen error on Google, you will most likely be led to the official solutions provided by Microsoft which can also be found here. Like many other solutions available on Microsoft site, it usually wouldn’t work or just not the right one to use. So, what we did was we collected all possible fixes and solutions provided by people who also had the same problem and fixed it themselves from around the internet and listed them in this post. Frankly, we also met the same Windows 10 black screen problem very frequently while we were trying to upgrade several of our machines to Windows 10. 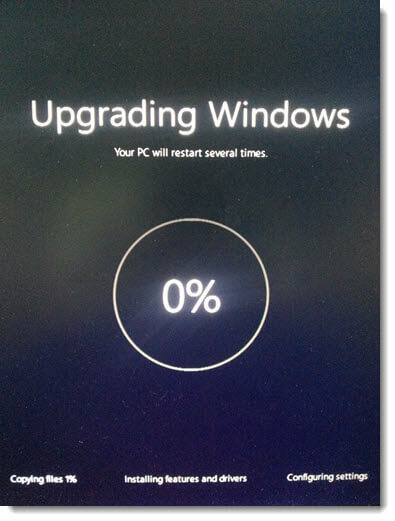 This may happen when you are still on your Windows 8 or Windows 7 while downloading and preparing for Windows 10 installation. You would probably be seeing a black screen with a working white mouse cursor but nothing else. First you should try to wait it all out. The update may be preparing your installation while logging you out of Windows. The login screen should come back shortly. If you have waited for like 30 minutes but still nothing yet, here’s a trick that worked for us. Hold the Windows Key and press down arrow twice, then hit enter. This should bring back the windows login screen. If it still doesn’t solve the problem, you might have to just restart your computer and try the upgrade again. If you were seeing a total black screen, it could mean many things. Try to wait for a while and see if the cursor will come back working. If it comes back, hit space bar and see if you can bring up the login screen. If the cursor doesn’t even appear, the best chance is to restart your computer and try the upgrade all over again. You might not need to re-download Windows 10 as Windows Update should have already downloaded it and all you have to do is to re-run the upgrade. If Windows 10 upgrade failed black screen continues to appear, read the fixes below. If your PC or laptop computer has an built-in integrated graphics while you also have a dedicated graphic card installed, there may be a conflict between the graphic adapters while upgrading to Windows 10. Try plugging your HDMI, DVI or VGA adapter to your built-in integrated graphics. This should solve the issue. Once your Windows 10 upgrade is done, change back to your main dedicated graphic adapter. The Windows 10 Upgrade error code 80072ee2 means that Windows Update was undergoing enormous amount of requests while trying to upgrade to Windows 10. It is usually due to any of your Firewall blocking Windows Update from requesting for updates. If you have any third-party Firewall installed or you have previously blocked Windows Update in the Windows Firewall, add the following server sites to the exception list. If you received error 0x800F0922 while upgrading to Windows 10, disconnect your VPN or whatever proxy server you were using. The error code 0x800F0922 means that the upgrade couldn’t connect to Windows Update to retrieve the files necessary for your upgrade. Check your connection to see if it works especially if you rely on something like a VPN or proxy connection. There are always problems with Windows Update if you use a proxy connection. Restart your connection devices, re-enable your network adapter in the adapter settings, basically just make sure your connection is working with Windows Update. These specific errors (80072efe 80072efd or 0x80072efe 0x80072efd) may occur because of the connections required for Windows Update to run for the Windows 10 upgrade were interrupted by something. This can also be due to your internet connections, proxy server, VPN (if any), firewall or antivirus causing the connection between your PC or laptop and the Windows Update servers to fail. Double check the things mentioned and see if they are working and not blocking Windows Update server while you run the upgrade. Optionally, you can run Windows Update troubleshooter to automatically troubleshoot and fix the problem. The Windows 10 upgrade failed to install error C1900 101-40017 indicates that you have insufficient disk space for the installation files and the upgrades. The upgrade will stop if it finds that your disk space is not enough for current installation and/or future Windows Updates when your Windows 10 upgrade is done. Free up some space and re-run the upgrade. You may need to re-download the Windows 10 files again because the download may have stopped half way while it detected insufficient disk space.